Welcome to a new series, hosted here on the blog. Every Tuesday night, one of our PreApproved sisters will share her story on letting go of a love idol. Together, we’re giving up our love idols, and we’re not taking them back. We are already approved; we have nothing to prove. 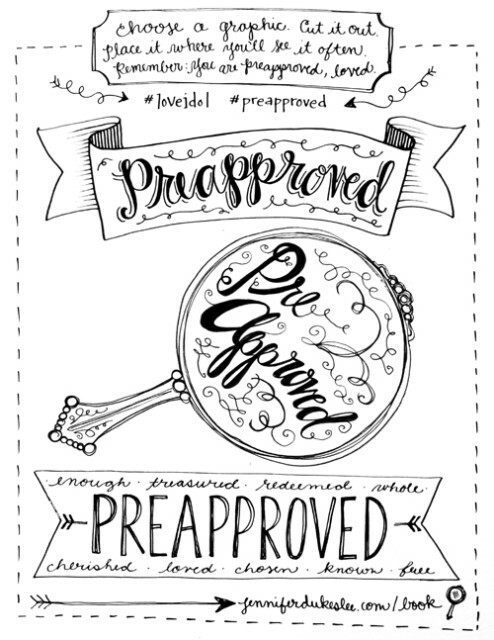 In Christ, we are #preapproved. Last year when I read Jennifer Lee’s book ‘Love Idol’ God did a deep work in me, making me aware of my tendency toward fashioning unseen not-gods into something that took the place of Him. I didn’t struggle with the more ‘obvious’ idols—my looks, my weight, my approval by others—no, I was above all that. Until I gained 15 pounds. Fifteen. To look at me you’d say, “what’s the big deal?” But friends, you know what a difference even 5 pounds makes between you and your favorite pair of jeans. The pounds crept up on me over last summer….each day there was something else I couldn’t button or zip or snap. My -ahem– undergarments were stiflingly snug. It was very uncomfortable to bend over and tie my shoes. Argh! How did this happen? Well, age and gravity and 3 weeks of company and too much time on the computer will do that to you. 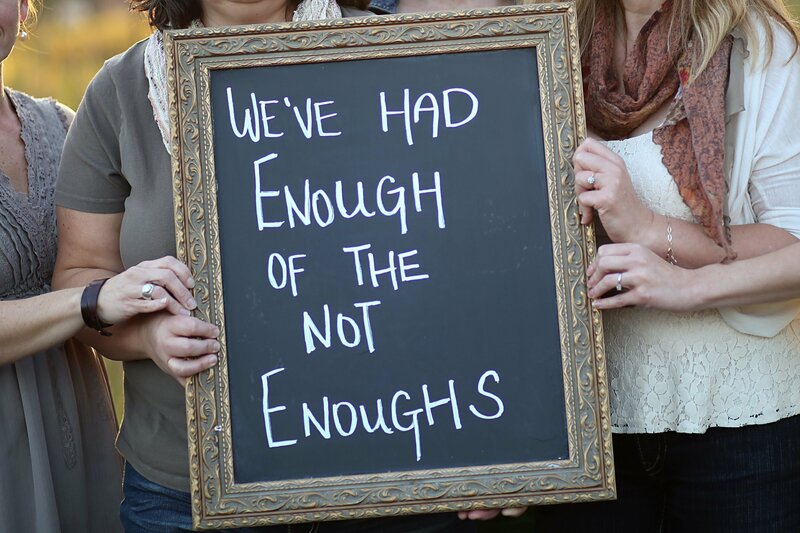 I found myself obsessing about my weight—I hadn’t done that for 35 years. Every moment of every day was consumed with what I could and couldn’t eat, how was I gonna manage to lose it? Could I join a gym? (No, no time…) Eat less, move more…..I know, I know. But there was all that company and then I got a summer teaching job and more eating and more sitting. All I could think about was my weight. So I went to the Goodwill. Many, many times. (All those visiting relatives—it was a great excuse for an excursion!) And over time, I got new capris and new blouses and sleeveless tops. Even a dress that fit. As I fit into my new summer clothes, I felt well, very blessed with some nice things, but grateful that my mind wasn’t consumed with the outside of me and how to FIX it. God wanted me to move into something that FIT, not worry about finding a FIX. God reminded me that my word for 2013 was ‘Fit’. Then at the end of the year He told me he was blowing up the container “because it was too small to contain what He was going to do.” (from my journal). God was (and IS!) making me new….His works in my life won’t fit in the old me with skin on. I needed to get my eyes off my flesh and the outside of me to free up my spirit and soul to focus on what was on the INSIDE…. More grace, forgiveness, patience. More learning and walking in God’s love, reminding myself I am ‘Pre-Approved’ Just the way I am. That’s a message I’ll have to repeat until my dying day. Jody Lee Collins is currently in the sweet spot of life that includes grandchildren and working when she wants as an Elementary Guest Teacher. 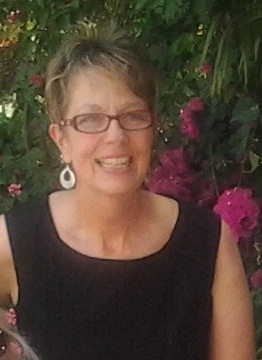 Jody’s passions include singing, gardening and writing. 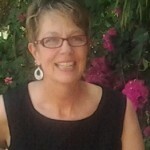 Her work has been published in various publications over the past 30 years; she currently writes weekly on her blog, Three Way Light. She has also guest posted at (in)courage, BibleDude.net and for The High Calling. Originally from Southern California, Jody and her husband now call the Seattle area home. She enjoys serving in Women’s ministry and singing on her church worship team, where she recently learned to play the cajon (Peruvian beat box)—quite possibly the most fun ever. Click here to find out more about the Love Idol movement. Click here to purchase the book that inspired the movement. Click here to join us on Facebook as we lay down our Love Idols and declare our #preapproved status in Christ. Click here to print the black and white preapproved cutouts. Place these where ever your Love Idols have lurked! 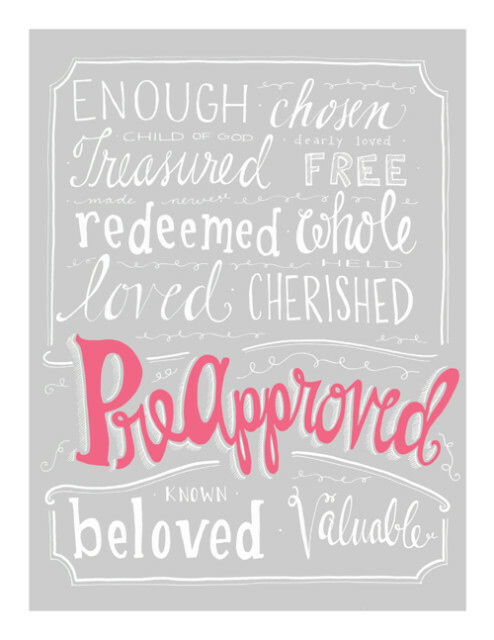 A pink PreApproved printable: to frame, to put on your refrigerator, to give to a friend. Click here to print. My gift to you, brave soul! Wearing clothes that fit makes me feel better. And reading your words makes me smile, Glenda. “More grace, forgiveness, patience. More learning and walking in God’s love, reminding myself I am ‘Pre-Approved’ Just the way I am. That’s a message I’ll have to repeat until my dying day.” Indeed, we’ll never achieve perfection this side of heaven. Grace, forgiveness, and patience will need to be applied repeatedly. But, oh the relief that we are pre-approved as we are. The steps of growth we attain are not for God’s (or anyone else’s) approval; they are to fit us to live for the praise God glory. What an incredible honor! Jody, I found my way over here from your blog (“How to Give a Thank You Speech)…are you me in disguise? I could have written that post! Except for the last part–the important part—the part about being accepted just as I am…I write about that, I tell everyone that. It’s like my focus…but I, too focus on my extra weight. I love the FIT-FIX thing. I just have the hardest time accepting that I’ve got a grandma body (and I’m not a grandma!). Thanks for posting this! Time to listen to what I preach! Mary, I’m so glad these words resonated…….Jesus continues to remind ME what I said about being accepted. Isn’t it something how, when we accept that we are loved just the way we are we move easier into caring for ourselves better? I think it has to do with loving ourself as God does. Good words, my friend.